Samsung is out there and they are making sure that you are not going to forget about them that easy, eleven new digital cameras! Following the success of the Samsung Digimax V4 and V3 models (unveiled at PMA in March, 2003) the new V50 is one of the new models that replaces them and are lifting the Digimax line-up to new heights, with new capabilities and features. The V50 model combines a number of "world's first" features into a stylish, user-friendly and affordable package. Following in the footsteps of the popular V4 and V3 the V50 offer quality construction, world-class Schneider optics, a plethora of customization modes and other features to create one of the foremost digital cameras in its class. Samsung has also designed a series of top quality conversion lenses for the V50 model, further expanding the cameras' already impressive range of features. Consumers will be able to choose from among three wide angle and telephoto lenses. All three will be sold separately as optional accessories for the V50 camera. 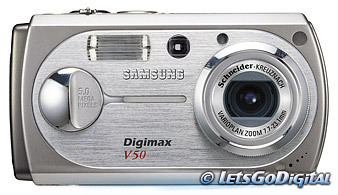 The new Digimax V50 features a new 5.3 Megapixel CCD in a stylish aluminium body and a high-quality f2.8-4.9 Schneider 7.7 - 23.1mm lens (equivalent to a 38-113mm lens in 35mm film). A "Macro" mode captures images as close as 4cm, while the 5x digital zoom extends the range of the Schneider lens into the super-telephoto range. A 2.0-inch TFT LCD screen provides a large focusing area and is also home to the camera's wider range of creative controls. The intuitive graphical user interface (GUI) allows users to easily navigate the camera's menu of features and capabilities. Photographers have a full range of custom choices including a variety of exposure modes, three ISO settings, five flash settings, and more. The V50 utilizes a combination mechanical and electronic shutter to capture images at up to 1/2000 of a second. The Digimax V50 can capture still in single, continuous or AEB mode, at sizes up to 2592x1944 pixels and store them as TIFF, JPEG (DCF) or DPOF format. The camera can also capture movies in MPEG-4 format at a resolution of up to 640x480 at 30 frames per second. AEB shooting provides a choice of presets custom designed for some typical or difficult to control situations. The Digimax V50 includes pre-programmed settings in an Easy mode, Program mode, Movie mode and Scene modes including: Children, Landscape, Close-up, Sunset, Dawn, Backlight, Firework, Beach & Snow, and Portrait. The Digimax V50 is using the SD (Secure Digital) or MultiMedia Card or the new Memory Stick DUO card for storage, the camera is able to save the images onto either of the card slots. The V50 transfers images via its built-in USB 2.0 connection, and comes with software for both the Windows and the Macintosh platforms. The Digimax V50 can also be connected to NTSC or PAL external monitors for image and movie playback via the included connectors.